Some more Black Friday deals! This is possibly the most original Black Friday deal we’ve covered this year. It is well worth thinking about if you are heading to Asia or the Middle East next year, especially if you have picked up Jade status in Shangri-La Golden Circle as an American Express Platinum benefit. We ran a separate article yesterday on the British Airways ‘2 Club World tickets for £2018’ promo which is running over Christmas and New Year. The main BA Holidays page is here and the Club World / Club Europe luxury holidays page is here. Air New Zealand is selling 100 economy tickets to Los Angeles at 10am today for just £175 return. Dates are limited and, frankly, your chances of getting one are slim but feel free to try! ANZ will also have special fares in Economy, Premium Economy and Business to Los Angeles throughout today. I don’t know how much they will be, but you will find the details on the Air New Zealand Black Friday page here. Radisson is running two interesting offers. First up is a 100% bonus when you buy Radisson Rewards points. The link to buy points is here. The offer runs until 27th November. The maximum number of points you can purchase is 80,000 (40,000 + 40,000 bonus) for $280. This is £219. The key London hotels such as Park Plaza Westminster Bridge – a modern London property with a pool and next to the London Eye, London Dungeon, London Aquarium etc (photo below) – are 70,000 points per night, so £191. I reviewed the hotel here. The May Fair (which I reviewed here, and didn’t like much) is also 70,000 points. 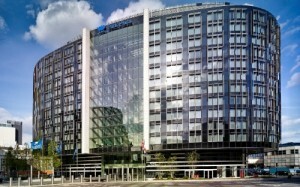 The new Park Plaza Waterloo is 50,000 points which would be £137, and you don’t get much in London for £130 these days. At the more prosaic end of the scale, there are various Park Inn budget hotels around the UK for 15,000 points per night. Under this promo, 15,000 points would cost you just £52 based on the pro-rata price of 80,000. Remember that you can also transfer American Express Membership Rewards points at the 1:3 rate if you need a few extra points for a planned redemption. The second Radisson offer is 30% off weekend stays (and all week at Easter) until 31st August 2019. This covers Radisson Collection, Radisson Blu, Radisson RED, Radisson and Park Inn by Radisson hotels in Europe, Middle East and Africa. The Easter period is treated as a full month, from 5th April to 6th May. You can see the list of participating countries on this special Black Friday page of the Radisson website. The last day to book is 27th November. Virgin Atlantic Black Friday / Cyber Weekend sale - flight deals from £1,089 return in Upper Class! Worth also bearing in mind that the Luxury Circle rate (e.g. through Bon Vivant) may work better on shorter stays. Books into the same BAR-equivalent rate but you get a fixed $100 credit and a guaranteed room upgrade. Be wary of the BA holidays offer – coincidentally I checked the price of a flight & car package I booked for my OH for next summer and it had gone up by £1000! £100 off that doesn’t really make up for the overall increase. There’s too much of that happening this year. Read someone tracking TUI price to see it jump £250 the week before they offer 150 off. Shangri-La deal requires you to be a member of their GC and promo code (GCMBF) to be used whilst logged in with your GC credentials. The rate used for the 50% promo will be best flexible rate but in this instance bookings will be non-refundable etc. I had some fraud on my BA credit card over night – my card was part of the latest batch caught in the data breach. It could just be a coincidence but maybe not. I would recommend people play close attention to their statements. Creation cancelled and reissued mine a couple of weeks ago after my card number apparently being on a list they received from Mastercard. Still waiting for new card, quite a pain not to be able to spend on it – thanks, BA! I thought I had ‘won’ two tickets @£175 each to LAX. Set up the PC …10am, clicked on the page I had already set up with flights within the dates offered…pressed on the £175 offered flights…went through, passenger details etc.,…..upshot ?…nothing like £350 total, nearer £500 ! That might still be a ‘bargain’ , but no thanks. You could reserve flights for £25 for 3 days which does not require the input of passenger details etc. I suspect that is what most (all?) successful applicants did because the seats were only confirmed once a purchase had been made. I had a look at this but dates didnt work for me. I hope someone on HfP grabbed a bargain. With the limited dates they offered, it was useless. Rhys (our intern) got one. Haha good work, Rhys – enjoy LA! I got a pair of the £175 tickets as well. I did use the fare hold feature, and signed in my account with a credit card saved beforehand. Your consolation is that tickets for last year’s HfP Christmas party apparently went even quicker than the Air New Zealand Black Friday £175 Flight to LAX offer. This one may be the same ….. should be announcing the details next Monday or Tuesday. Don’t have the time or resources, unless we make everyone pay in advance and refund the unlucky ones. Impossible to send out 250 invoices and track them all. Can’t wait. Any hints about where in Manchester it will be? We’re not going to Manchester! Except for Rhys who is reviewing the new CP Oxford Road next week. Do you think we can buy 80,000 using two accounts and then transfer them into one to book a 105,000 redemption? Elite members can transfer points free of charge to an another account at the same address, I think.